I also need to apologize for having to make you prove that you aren't robots when you leave a comment on the blog... I just got fed up with all of the spam comments I was getting! Lastly, I hope you all have a really fabulous weekend! Beautiful! Can't wait to see the finished piece. Yes, I have the Pinterest bug too...so much inspiration out there! How funny!!! I've just signed in to Pinterest, too!!! Tomorrow I'll start some pinning!!! Your WIP looks very lovely, can't wait to see it all. Such a lovely doily. I love the square shape. 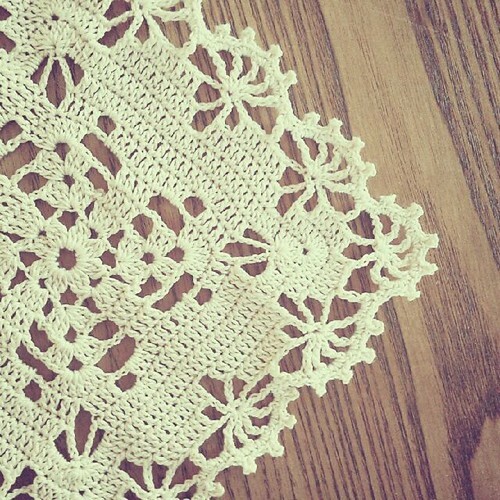 I'm working on a doily right now too for a future project, but I kinda have a few kinks in it I need to work out.